Taking a look at Jesus in the present moment while trying to see him as he was two thousand years ago, creates an immediate conflict. Let’s use this phrase as an example: “taking its own sweet time”. A city slicker like me might ask what does ‘sweet time’ have to do with the computer project I’m trying to complete in a timely manner? Yet, it wasn’t until I moved into a country home with an honest to goodness vegetable garden, that I heard myself saying, “those green tomatoes will just be ready in their own sweet time”, and the phrase actually meant what it said. I remember having one of those “Duh!” moments. A farmer coined that phrase a long time ago for his maturing fruits and vegetables. The phrase made sense in that context. Though often repeated today it is really just gobble gook for a townie. Just think of modern slang, political scandals and complaints, ‘in’ jokes and the growing distance between well written English and a teen’s tweets. The mind boggles. Now, we begin to understand the gulf between understanding another culture, no less another time period. Understanding the 40s and 50s is hard enough-two thousand years is almost ridiculous. However, though surmounting this chasm is the first step in making sense of any ‘snapshot’ of the life and times of Jesus and will demand a whole bunch of research, I am officially retired. I have to admit the prospect sounds like fun. And so I gather around me books, bibles, articles, DVD’s and set up an undemanding, yet consistent research schedule. Woa! Hold on! Two thousand years of cultural clutter, looking like a Hollywood reproduction of end world devastation clogs my lens view. Like a journalist/photographer in a war zone, I will have to wade carefully through the rebuilt and reconstructed, the hidden propaganda landmines of times past. Think of the overlays of New Age idealism, Victorian proprieties, bloody reformations and inquisitions, the burning of literature and sciences in the dark ages, the political imperatives and religious prejudices and superstitions all the way back to the bickering, backbiting and down right violent disagreements within the Jesus movement right from the get go in the first century. Whew! Breathless, but still undaunted I make the commitment to continue. I shall don my suit of personal “body armor”-an open mind, the willingness to learn, to be wrong, to be disappointed and yes, to even be amazed! And I add one more piece of armor, perhaps the most important – my willingness to listen to the guidance of the Holy Spirit each step of the way. * Bette Cundiff has been a teacher of A Course in Miracles since 1977 and has traveled throughout the US, Canada and Australia setting up conferences which teach about forgiveness. 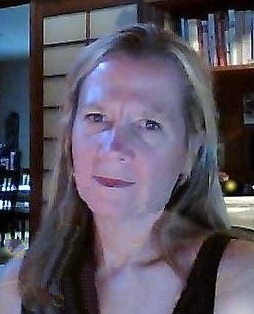 She is author of the internationally recognized children’s version of A Course in Miracles, “The Children’s Material” and has also produced a full miracles course in a novel for the young reader “Help is on the Way!” In addition, Bette is author of “Side by Side, the Twelve Steps and A Course in Miracles”. Many of her books have been translated into Spanish. In 1976 a powerful light filled ‘voice’ impressed onto my mind wonderful thoughts that I could not help but write down. Writing books naturally followed. Over the years this Guiding Light has occasionally assumed a sense of personality, but no matter, I knew the wisdom given to me came from That which fills us, directs us and of course loves us all. For more than thirty years I lectured around the world on spiritual psychology, comparative religions, spirituality, A Course in Miracles, the Twelve Steps and co-dependency recovery and so much more. From that time on, studying, sharing, starting up study groups globally, and writing about what I had learned and what was ‘given to me’ through inner guidance, has been my passion. In today’s world of electronic interconnectedness, it’s amazing how some ideas seem to go ‘Viral’ and others don’t. 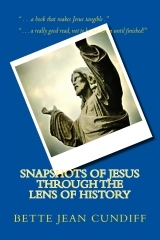 I received word of this book via a group email from a friend Tricia Aude who was a friend of Helen Schucman and William Thetford, scribe and co-scribe respectively of A Course in Miracles and currently transcribes the messages of Jesus aka Rajpur ( Hindi for ‘place of the prince’) as He delivers them through Paul Tuttle. Or was it a message I received from another dear friend who mentioned they have just purchased and read it via Kindle or a second friend who shared they had just finished it. The Universe was saying, pay close attention, just as it did years ago when I kept hearing ‘A Course in Miracles’ mentioned over and over or recently when I learned of Anita Moorjani’s NDE experience. It appears that this is another one of those ‘wake up calls’ from [y/our] BEING. 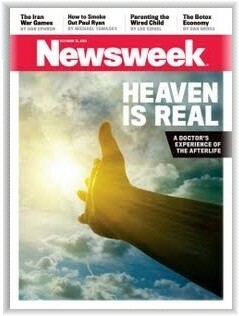 The person who experienced it was a skeptical neurosurgeon scientist. The CORTEX of his brain was not functioning yet he experienced crystal clear clarity. He had a complete and total recovery from E. coli meningitis, which is a medical miracle. We may have seen television shows regarding NDE’s which often begin with phenomenal claims of other worldly experiences and end with a scientific de-bunking using medical science of the brain to prove it was ‘all in their head.’ The evidence the scientists present is offered in an effort to show that there IS no ‘scientific proof’ that these experiences were anywhere but in the physical brain. This is exactly how Eben [Dr. Alexander] thought until his own first-hand experience of an NDE. Although I am very open minded, I always employ my own internal ‘TRUTH METER’. I ask, “Does this resonate with the Truth I know within as the Christ?” This experience Eben was relaying was very different from the NDE’s I am used to reading and hearing about and that caused my comfort zone to be stretched. 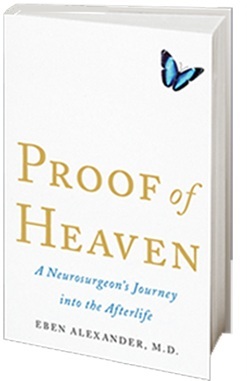 His NDE, in the beginning, wasn’t all warm and fuzzy and I wondered if it were truly REAL. When Dr. Alexander began to speak about the REALITY of his experience, that’s when my METER registered GREEN! I was getting a sense that the reality of the Interconnectedness and immensity of Spirit that Eben experienced could never be threatened. Dr. Eben Alexander, husband, father, neurosurgeon contracted the extremely rare condition of E. coli meningitis completely out of the blue. Only 1 in 10 Million people will do the same. He made a full recovery one month after lying in a coma, near death, for seven days. This book is his best attempt at trying to share an experience which was truly beyond words. As the book progresses, his story becomes an exquisite tapestry. The experiences of his family and friends and doctors in the hospital, dealing with this grave E coli infection, are interwoven with a recounting of Eden’s experience as a consciousness, with no connection to the past, in a ‘place’ where words could never do it justice. Even though it kept the attention of the reader by the vacillating between the solid world that we know and the ephemeral albeit Real world that Eben was experiencing, it wasn’t until toward the end of the book that I found myself grabbing for the tissues. Just as we have all experienced wanting to tell everyone we know about a great book we just read or a great movie we just saw, Eben wanted to share this discovery with his friends and family and most of all with his colleagues. And that’s when he came up against ‘himself’. He saw in their eyes his own disbelief; the disbelief he had once embraced. We are all so ensconced in the 3D that it seems we can’t see the forest for the trees. I began to see Eben, much as he sees himself, as another facet of our infinitude who knows now that he is “Here to Heal”. Eben recovered the memory of our larger connectedness. There is a part of Eben’s life that I have not mentioned and it has everything to do with the message he received and more importantly the Being who brought the message to him. Now I leave that mystery of WHO that was for you to discover, dear reader, although the message itself is for all to know and to remember. *Rev Reja Janaki Joy Green [Reja_CIMS] is one of the founding members of the Course in Miracles Society [CIMS]; She is the CIMS webmaster, newsletter editor and producer of the Daily Lesson Mailings. Rev Reja facilitates the Course in Miracles study group in Omaha, and at the time of this writing was in the 2nd year of the CMC Ministerial program. As a registered Yoga Instructor, Rev Reja teaches Hatha Yoga from the perspective of A Course in Miracles and hosts several social media groups for those who share this journey. Currently she resides with her loving husband Chris Green in Omaha, NE. every choice, and every thought of my entire life. When I read this paragraph in Anita Moorjani’s book “DYING TO BE ME: MY JOURNEY FROM CANCER, TO NEAR DEATH, TO TRUE HEALING” it reminded me of what my husband and I often say to participants as we begin our presentations on A Course in Miracles [ACIM]. We express the idea that absolutely every decision they have made in their lives has culminated in bringing them to this room and to this moment. Likewise, every decision I have ever made in my life has brought me to writing this review in this moment and all of the decisions you have EVER made have brought you to this moment in which you are reading it. Yes, I have learned and have experienced fear as a power capable of manifesting dis-ease. This is quite understandable. And yet the second part of this sentence was an idea that might even go unnoticed if the reader were looking from their regular, comfortable, point of view. Such a concept may not be understandable and so glossed over. “…my great power had manifested as this disease.” What did Anita mean by this? Why would our POWER manifest as a disease? To answer this we may want to start with Anita’s experience of ‘disease’. A dear friend [Soni] and also her brother in law had contracted cancer and had perished from the disease. When this happened Anita became deathly afraid of getting sick herself and also afraid of the medical treatment when she saw how it had ravaged her friend’s body and had not prevented her death. In her study of cancer, Anita learned that cancer could come from many activities: the polluted air we breathe, the pesticides and preservatives in our food, the chemicals in the water we drink, even the negative thoughts that we think. Her fear only increased. “I tried faith healing, praying, meditation, and energy-healing sessions. I read every book I could get my hands on about cancer, learning every possible connotation given to the disease. 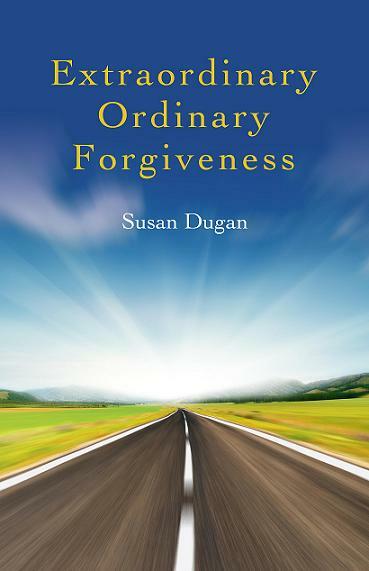 I worked on forgiveness therapy, and forgave everyone I knew—then forgave them again. I traveled through India and China, meeting Buddhist monks, Indian yogis, and enlightened masters, hoping that they’d help me find answers that would lead to healing. I tried being vegan, meditating on mountaintops, yoga, ayurveda, chakra balancing, Chinese herbal medicine, pranic healing, and Chi Gong. But despite all this, my cancer just kept getting worse.” (Kindle Edition, pp. 133-134). It was at the point of imminent total organ failure, after a four year battle, that Anita’s fight was over. She completely surrendered to – what turned out to be – REALITY. In this amazing book, DYING TO BE ME, Anita chronicles her life before her diagnosis in Part I, when she developed a limiting and fear-filled thought system based on years of harassment and abuse for being seen as ‘different’. She shares how she became completely ‘other centered’ and continually struggled to fit in and be accepted and yet the result was always a deep sense of unworthiness. Part II chronicles her journey to death and back. Anita describes the “Near Death Experience” [NDE] itself, and what happened next. “Being healed of cancer and working to find a new place in the world has been a surprising, challenging, and exhilarating journey! As a Course in Miracles student, reading this is a wonderful affirmation of what we are learning in the Course which teaches: ‘minds are joined’. We derive our power to create from our Soul which is eternal and to which we are eternally connected. There is only one Power and we are given free will to use that Power. When it doesn’t have an avenue of expression it will turn within. “Sickness is a defense against the truth. Time is also amazing when viewed from within the NDE. In ACIM we learn that time is an illusion. Anita comes to the realization that Now is the only time there is and how it holds our ‘salvation’! This book by Anita Moorjani is such an amazing gift of love. I am so deeply grateful for her willingness to heal others by sharing her experience of healing. Anita had tried ‘forgiveness’ as a healing method for her ‘cancer’ and it had failed. She was using the paradigm of thinking something needed to be forgiven, although forgiveness is only called for once there is condemnation. “Criminals have lost their center, and what they’re doing to others is actually a reflection of how they feel inside about themselves. We like to think of perpetrators and victims as ‘them’ and ‘us,’ but there is no ‘them.’ It’s all us! Reading these words puts me once again in touch with the essence of Who I AM. It seems only appropriate to end this article with the very last words in Anita’s book which are the truly inspiring and always make me cry to read them. “ I would want you to know that every part of you is magnificent—your ego, intellect, body, and spirit. It’s who you are—a beautiful product of this Universe’s creation. Every aspect of you is perfect. There’s nothing to let go, nothing to forgive, nothing to attain. You already are everything you need to be. It can seem so complicated, but it’s not. “If a religion makes you feel lesser than its deities, then you’ve either misinterpreted it or it’s not doing a good job of teaching you the truth. If a guru, teacher, or master makes you feel that you aren’t “yet” enlightened and still have more to “learn,” “release,” or “let go of” before getting there, then they’re not doing a good job of teaching you who you truly are, or you’re misunderstanding them. “Remind everyone close to you to be themselves, and tell them that you love them just the way they are! They’re perfect and so are you. There’s nothing not to love. Most suffering stems from feeling “less than.” You aren’t less than anything or anyone! You are complete. P.S. “As though to confirm my realization, I became aware of both my father and Soni communicating to me: Now that you know the truth of who you really are, go back and live your life fearlessly!” (p. 76). in the study of the stars and the planets. They lie deep within us, in the magnificence of our heart, mind, and soul. we can’t understand what is without. and reminding you of your own magnificence. Anita Moorjani was born in Singapore and then lived in Sri Lanka until she was 2 years old. An ethnic Sindhi woman from India, her family then moved to Hong Kong where she grew up speaking fluent Sindhi, Cantonese and English, as well as being conversant with a multitude of cultural idioms. She was educated in English schools in Hong Kong and later studied in England before returning to Hong Kong to take up a senior management position for a French fashion company where she traveled all over the world using her multi-cultural, multilingual background in a variety of business and social settings. Opening to Divine Love in Contemplation. My approach to spirituality before studying the Course was a blending of yoga and seeking Christ within, which included a heavy emphasis on practicing meditation. Yoga means “union.” I thought meditation was my best means of joining with the Holy Spirit to bring about unification. But what does the Course say about joining with the Holy Spirit? Joining with Him in seeing is the way in which you learn to share with Him the interpretation of perception that leads to knowledge. You cannot see alone. Sharing perception with Him Whom God has given you teaches you how to recognize what you see. It is the recognition that nothing you see means anything alone. Seeing with Him will show you that all meaning, including yours, comes not from double vision, but from the gentle fusing of everything into one meaning, one emotion and one purpose. God has one purpose which He shares with you. The single vision which the Holy Spirit offers you will bring this oneness to your mind with clarity and brightness so intense you could not wish, for all the world, not to accept what God would have you have. Behold your will, accepting it as His, with all His Love as yours. All honor to you through Him, and through Him unto God. Yes, union with the Holy Spirit happens in meditation, but prior to studying the Course, I did not appreciate the value of perception and did not know how to best use it for my spiritual growth. I know that in meditation I could reduced my scattered perceptions by focusing on one perception. Also, I knew that I could let go of even that single perception and enter the restful state of contemplation. But I thought that the limit to perception was its unification into one perception during meditation, and I was convinced that the best use of perception was to let go of it altogether. It did not occur to me that what I had learned about perception in meditation could be generalized into my daily life. I thought that my outer experience of the world was so filled with scattered perceptions that I could not possibly unify them as I could in meditation. Yet from the Course, I would learn how to focus on what the quotation above describes as the “one meaning, one emotion, one purpose,” which is the one purpose God shares with me. It is the purpose of oneness itself, which in a practical sense means the unification of perceptions that seem to be separate. The oneness of my meaning, emotion, and purpose, and, indeed my oneness with God Himself, is in my mind now. I realized that to find the oneness in my mind, I needed to learn how to unify my thought system, meaning to unify what appeared to be totally disorganized perceptions. It seems at first glance that all these approaches to changing perceptions are different, but they have the common element of unifying perceptions by directing new perceptions toward the one goal of God. Because my background was in Christian yoga, I decided to use the term “Miracle Yoga” to describe my understanding of the Course. The goal of the Course is to unify perceptions. The five aspects of Miracle Yoga emphasize a single approach to unifying perceptions. Miracle Raja Yoga arrives at the unification of perception by focusing inwardly in meditation on one thought, which has already been emphasized. Miracle Bhakti Yoga brings about the unification of perception by centering on one emotion, which is love. Miracle Karma Yoga relies on maintaining one function to accomplish the unification of perception. Miracle Relationship Yoga produces the unification of perception through one relationship. 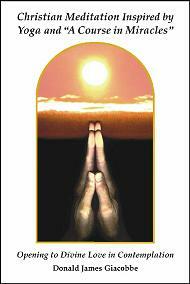 Miracle Jnana Yoga achieves the unification of perception by seeking one truth. In Him you have no cares and no concerns, no burdens, no anxiety, no pain, no fear of future and no past regrets. In timelessness you rest, while time goes by without its touch upon you, for your rest can never change in any way at all. You rest today. And as you close your eyes, sink into stillness. Let these periods of rest and respite reassure your mind that all its frantic fantasies were but the dreams of fever that has passed away. Let it be still and thankfully accept its healing. No more fearful dreams will come, now that you rest in God. Take time today to slip away from dreams and into peace…. You rest within the peace of God today, and call upon your brothers from your rest to draw them to their rest, along with you. You will be faithful to your trust today, forgetting no one, bringing everyone into the boundless circle of your peace, the holy sanctuary where you rest. Open the temple doors and let them come from far across the world, and near as well; your distant brothers and your closest friends; bid them all enter here and rest with you. Miracle Bhakti Yoga emphasizes love. The focus on this one emotion of love unifies the mind because love itself is unifying, described in this way: “…the attraction of love for love remains irresistible. For it is the function of love to unite all things unto itself, and to hold all things together by extending its wholeness.” Focusing on love brings you to the “real world,” which is also called the “circle of brightness” and the “happy dream,” and which consists of only loving perceptions. This world of light, this circle of brightness is the real world, where guilt meets with forgiveness. Here the world outside is seen anew, without the shadow of guilt upon it. Here are you forgiven, for here you have forgiven everyone. Here is the new perception, where everything is bright and shining with innocence, washed in the waters of forgiveness, and cleansed of every evil thought you laid upon it. Here there is no attack upon the Son of God, and you are welcome. Here is your innocence, waiting to clothe you and protect you, and make you ready for the final step in the journey inward. Here are the dark and heavy garments of guilt laid by, and gently replaced by purity and love. Yet even forgiveness is not the end. Forgiveness does make lovely, but it does not create. It is the source of healing, but it is the messenger of love and not its Source. Here you are led, that God Himself can take the final step unhindered, for here does nothing interfere with love, letting it be itself. A step beyond this holy place of forgiveness, a step still further inward but the one you cannot take, transports you to something completely different. Here is the Source of light; nothing perceived, forgiven nor transformed. But merely known. Miracle Karma Yoga involves taking selfless action and expressing your function. Applying the one function of following God’s Will and God’s Plan leads to the “Circle of Atonement.” Your special function is always a form of forgiving others, which enables you to forgive yourself. Everyone has a special part to play in the Atonement, but the message given to each one is always the same; God’s Son is guiltless. Each one teaches the message differently, and learns it differently. Yet until he teaches it and learns it, he will suffer the pain of dim awareness that his true function remains unfulfilled in him. The burden of guilt is heavy, but God would not have you bound by it. His plan for your awaking is as perfect as yours is fallible. You know not what you do, but He Who knows is with you. His gentleness is yours, and all the love you share with God He holds in trust for you. He would teach you nothing except how to be happy…. Each one you see you place within the holy circle of Atonement or leave outside, judging him fit for crucifixion or for redemption. If you bring him into the circle of purity, you will rest there with him. If you leave him without, you join him there. Judge not except in quietness which is not of you. Refuse to accept anyone as without the blessing of Atonement, and bring him into it by blessing him. Holiness must be shared, for therein lies everything that makes it holy. Come gladly to the holy circle, and look out in peace on all who think they are outside. Cast no one out, for here is what he seeks along with you. Come, let us join him in the holy place of peace which is for all of us, united as one within the Cause of peace. Miracle Relationship Yoga is focused on holy relationships based on partners having a common purpose and seeing holiness in everyone. Maintaining a relationship of holiness allows you to see the “face of Christ,” which is the “vision of the Son of God.” In the holy relationship, you have the opportunity to see the light behind your brother’s body and see his guiltlessness. Looking past your brother’s mask, you can even perceive the face of Christ. “The face of Christ is looked upon before the Father is remembered.” The face of Christ reminds you of your true relationship with God and with all your brothers and sisters in Christ. You have a real relationship, and it has meaning. It is as like your real relationship with God as equal things are like unto each other. Idolatry is past and meaningless. Perhaps you fear your brother a little yet; perhaps a shadow of the fear of God remains with you. Yet what is that to those who have been given one true relationship beyond the body? Can they be long held back from looking on the face of Christ? And can they long withhold the memory of their relationship with their Father from themselves, and keep remembrance of His Love apart from their awareness? 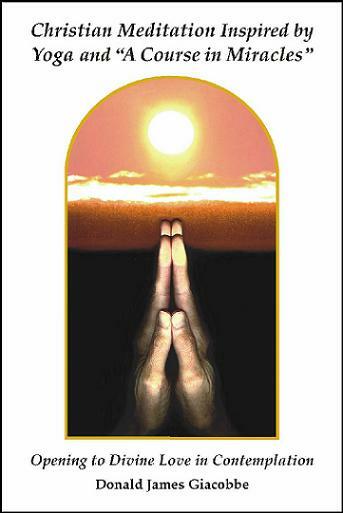 Miracle Jnana Yoga is concerned with finding truth and gaining understanding. This seeking of one truth leads you to the “borderland” where all false perceptions are replaced by true perceptions. Here you choose between illusions and truth by bringing them together and seeing that illusions are meaningless and so can be easily released. There is a borderland of thought that stands between this world and Heaven. It is not a [physical] place, and when you reach it is apart from time. Here is the meeting place where thoughts are brought together; where conflicting values meet and all illusions are laid down beside the truth, where they are judged to be untrue. This borderland is just beyond the gate of Heaven. Here is every thought made pure and wholly simple. Here is sin denied, and everything that is received instead. This is the journey’s end. We have referred to it as the real world. And yet there is a contradiction here, in that the words imply a limited reality, a partial truth, a segment of the universe made true. This is because knowledge makes no attack upon perception. They are brought together, and only one continues past the gate where oneness is. Salvation is a borderland where place and time and choice have meaning still, and yet it can be seen that they are temporary, out of place, and every choice has been already made. There may be some uncertainty in your mind about whether you will ever manage to let go of all illusions and accept your place in Heaven. But the Course maintains that there is no uncertainty in God, and so, you can trust in His Will being accomplished. “Have faith in only this one thing, and it will be sufficient: God wills you be in Heaven, and nothing can keep you from it, or it from you.”Your going Home is only a matter of time, and time itself is just another illusion. *Donald James Giacobbe was the director of the Aquarian Age Yoga Center in Virginia Beach, VA. He provided yoga teacher training certification courses and led meditation workshops and retreats. Don has attempted in his teaching of meditation to strip away the rituals of Zen Buddhism and yoga practices and transpose only the bare essence into a Christian context. Don encourages the doing of God’s Will, being receptive to the Holy Spirit, and finding Christ within the temple of one’s own heart. While respecting all Christian spiritual expressions, he became a monk by making his vow directly to God, without the stamp of approval from any religious organization. 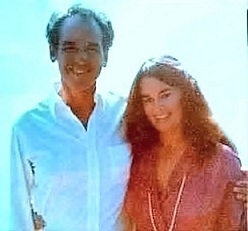 In 1988 Don became a student of A Course in Miracles, and his practice and teaching subsequently changed from “Christian Yoga” to “Miracle Yoga” This form of spirituality is a synthesis of yoga and the philosophy of A Course in Miracles, encouraging the seeker to see with “forgiving eyes” and perceive Christ in everyone. Don’s goal is to maintain a balance between opening to divine love inwardly and allowing that love to be extended outwardly to others. ** All quotes in the article and references (with pages noted) are from the “second edition” of the Course published by Foundation for Inner Peace. Oh my! What an experience. There I am on my porch-deck, crying – then laughing – then laughing – then crying. There was so much I resonated with in Scott Kalechstein Grace’s book “Teach Me HOW TO LOVE” Teach Me How to Love: A True Story That Touches Hearts & Helps With The Laundry. I absolutely loved it!! their cronies hadn’t believe them. because their hearts have been touched by the extension of Love. can always be expressed. Love waits on welcome, not on time. met and married my Soulmate!! *Scott Kalechstein Grace lives in Marin California with his lovely partner Venus, and their darling daughter Aysia. He is a Writer / Coach / Comedian / Speaker, as well as a Singer / Songwriter / Recording Artist / Minister and Workshop Leader. When I was asked by the author to write the forward to her book, I was extremely honored. I agreed to read the book and then I would decide how I felt about it. In A Course in Miracles our Elder Brother reminds us that there are no accidents. “There are no accidents in salvation. they have the potential for a holy relationship. ~A Course in Miracles-original edition [ACIM-oe] Manual For Teachers #3 What are the Levels of Teaching? You have this book in your hands or you are reading it as an eBook and that is no accident. Every decision you have ever made throughout your entire life has brought you to this beautiful moment of NOW. And in this beautiful moment of NOW there is no past. The future is not yet. There is only this Holy Instant in which you are being called once again to LISTEN. LISTEN within for Guidance. LISTEN to your Soul and let it tell you the next right step on your journey without distance. That next right step may very well be these “Sacred Steps”. I first met Bette Jean Cundiff in New York City in the 1980’s when I attended a workshop she was giving together with Paul Steinberg. Paul was the brother of Saul Steinberg who was the printer of the very first set of the hardback edition of A Course in Miracles through Coleman Graphics. The workshop was called, “Miracle Experiences: The Goals and Healing of Your Special Relationships in ‘A Course in Miracles’ “ and was one of the first I had taken as I began my journey with A Course in Miracles. 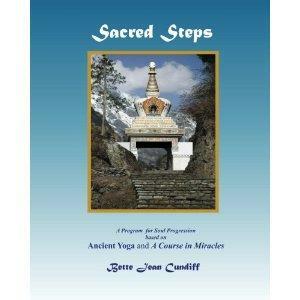 And now we come to “Sacred Steps: A Program for Soul Progression”, Bette’s most current book which appears to be a culmination of the past 30 years of studying, sharing, teaching and writing about what she has learned and what has been ‘given’ to her through inner Guidance. As a student and teacher of Yoga, as well as a student of A Course in Miracles, I cherish the beautiful and artful integration of ancient yoga with A Course in Miracles that Bette presents here. The ideas are thought provoking and creative but more than that, they are presented in a way that brings a feeling of peace and unconditional love. I felt nurtured and safe and my heart opened to their Truth. The words were more like notes in a symphony and each word and even each letter seemed to be wrapped in LOVE; a LOVE which was almost palpable. Describing each Chakra, Bette uses color, texture, and feeling to paint an in-depth picture offering a deep experience of their meaning. Then, in-between each description, additional information builds a foundation: Your Electromagnetic Field; The Power of the Universe as the Sacred Serpent; The Body’s Windows [major organs and glands] ; The Earth’s Windows [vortices]; The Celestial Radiance [personal aura]; The Rhythm of Color [Color as waves of energy]. I discovered that this foundation brought with it an appreciation for life. Bette beautifully presents the chakras as related to the levels of Soul evolution but then offers various modalities such as Sacred symbols [geometrics] as well as movement and affirmations to help with the integration. And finally there is practical application with a personal training program offered in the form of a Workbook. My sense is that this book is a blessed gift offered to your Soul from another aspect of the Infinitude which is One with you. It’s truly a gift of Love to Love. There is only this Holy Instant in which you are being called once again to LISTEN. LISTEN within for Guidance. LISTEN to your Soul and let it tell you the next right step on your journey without distance. That next right step may very well be these “Sacred Steps”. *Bette Cundiff has been a teacher of A Course in Miracles since 1977 and has traveled throughout the US, Canada and Australia setting up conferences which teach about forgiveness. She is author of the internationally recognized children’s version of A Course in Miracles, “The Children’s Material” and has also produced a full miracles course in a novel for the young reader “Help is on the Way!”. In addition Bette is author of “Side by Side, the Twelve Steps and A Course in Miracles”. Many of her books have been translated into Spanish. In 1976 a powerful light filled ‘voice’ impressed onto my mind wonderful thoughts that I could not help but write down. Writing books naturally followed. Over the years this Guiding Light has occasionally assumed a sense of personality, but no matter, I knew the wisdom given to me came from That which fills us, directs us and of course loves us all. For more than thirty years I lectured around the world on spiritual psychology, comparative religions, spirituality, A Course in Miracles, the Twelve Steps and co-dependency recovery and so much more. From that time on, studying, sharing, starting up study groups globally, and writing about what I had learned and what was ‘given to me’ through inner guidance has been my passion.